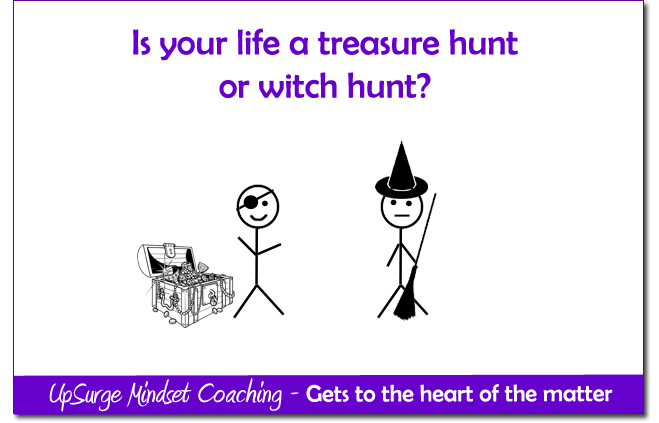 Is your life a treasure hunt or witch hunt? Have you ever been driving and then suddenly become aware of where you are and realised you’ve been on auto-pilot and not noticed anything about what you’ve been driving past? I know I have. This is a great example of what happens when we are not present – life literally and metaphorically passes us by when we become totally engrossed in our thoughts. Lots of clever people have said lots of clever things about the benefits of being present and if you google it you will find pages of inspiring quotes. Personally, I’ve found descriptions about it very different from experiencing it – kinda like describing the taste of a strawberry to someone who has never eaten one – it’s impossible to convey the unique smell, taste and texture! Our senses only have a reference for what they have experienced and because we are all unique we each experience the world uniquely. Now things get really tricky – the more you pursue presence the further you drive it away. If you are someone like me who relies on effort, focus and determination to nail your goals, then becoming present is a right stinker – the idea of letting something come to me rather than going out and hunting it down feels far too passive! What about all those motivational statements like ‘anything that’s worth having is worth working for…blah blah blah”. What makes it even worse is that once you have achieved it the little blighter doesn’t hang around from that day forward – it’s a real ‘got it, lost it’ game for the rest of our lives! Arrgghhh! Our thoughts, bless them, never shut up – 24/7 – yabba, yabba, yabba all day and all night. Sometimes they are brilliant, entertaining and loving but other times they are angst ridden, regretful, obsessive and create horror movie worthy stories. We rehash conversations where we wish we had said something else, we replay situations where we felt guilty, we undermine our self-confidence by saying things to ourselves we wouldn’t say to our worst enemy…in other words we live in the past or the future. So if life passes us by when we aren’t present; we can’t understand presence until we have experienced it; the harder we try the less likely we are to achieve presence; when we do achieve it we can just as easily lose it again; is presence worth it? Hell yeah! The access we get to our creative abilities, our compassion, our intuition, our ability to connect with ourselves and others and delicious ease and grace makes this state so worth the false starts, frustrations and fleeting glimpses. Luckily we were designed with some fantastic ‘presence’ tools right under our nose (our sense of smell), right at our finger tips (our sense of touch), right on the tip of our tongue (our sense of taste), within ear shot (our sense of hearing) and straight in front of us (our sense of sight). The quickest way to get present is a slap in the face (dramatic and uncomfortable) so I’m gonna go for the second quickest way – get out of our heads and ask our bodies what’s going on. Using each sense in turn (what can I smell, feel, taste, hear, see, smell, feel, taste, hear, see…you get the idea) is a great way to flood your awareness with immediate information. Often you forget what you were obsessively thinking about so it mustn’t have been that important anyway. I like to think of life as a treasure hunt with some really subtle clues – if I blink I might miss them. I need to keep alert to what is happening right here, right now and if my mind is tripping off and replaying the past or making up stories about the future, I am distracted and the ‘treasure’ will remain buried. Next time your head is running away with you, try coming to your senses to get present – don’t let the treasures right in front of you go undiscovered!